Mix yogurt, cashew nut,groundnut&raisin paste and make a smooth mixture. Cut the capsicum&onion in medium size. Heat oil in a kadai and add the onion and fry till its brown in color. Now add capsicums,tomato,green chillies&all dry masalas. After cooking a while add the curd mixture. Cut the cottage cheese in medium cubes&add it into the gravy,add some water salt&sugar. Cooked covered on a slow flame to a rich creamy gravy. At last add kasuri methi & garam masala powder for a nice aroma. 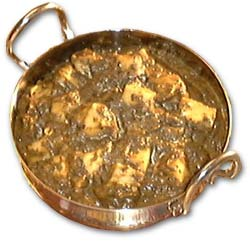 Recipe looks good will try it soon but picture looks like a palak paneer.